Whole world heard about Ukraine. Do you want to see your own eyes this wonderful country and amazing people? Travel company Modes help you organize family, corporate or individual vacations . You can visit the major cities of Ukraine: Odessa , Kiev, Lviv, Kharkov. We provide accommodation, meals and excursions throughout Ukraine. You can visit historical places, meet folk rites, culture, cuisine and traditions of the Ukrainian people. You prefer to rest on the beach? We will provide you and your family the opportunity to spend an unforgettable holiday on the Black Sea. Our company also develops private tours for business trip. You still do not know how to relax? 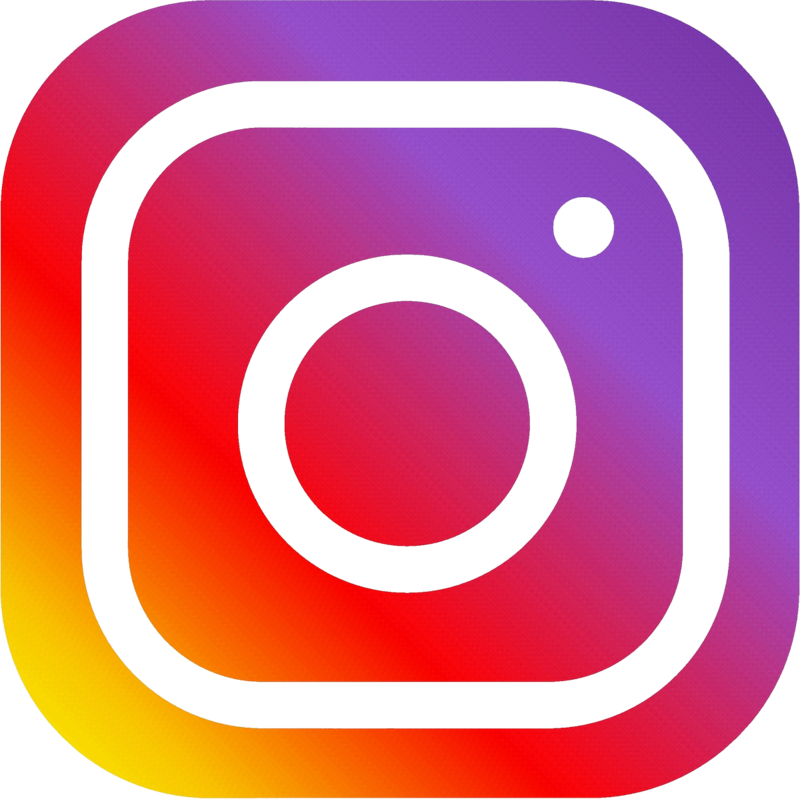 - Contact us and we will help you choose! Tourism is available for all! Romania and Moldova to the southwest, and the Black Sea and Sea of Azov to the south and southeast, respectively. It has an area of 603,628 km2 (233,062 sq mi), making it the largest country entirely within Europe. Throughout its history, Ukraine has been one of the powerhouses of world agriculture due to its fertile conditions. The country, as of 2011, was the world's third-largest grain exporterand is one of ten most attractive agricultural land acquisition regions. legislative, executive, and judicial branches. Since the dissolution of the Soviet Union, Ukraine continues to maintain the second-largest military in Europe, after that of Russia. The country is home to 46 million people, 77.8 percent of whom are ethnic Ukrainians, with sizable minorities of Russians (17%), Belarusians and Romanians. Ukrainian is the official language of Ukraine. Russian is also widely spoken. The dominant religion in the country is Eastern Orthodox Christianity, which has strongly influenced Ukrainian architecture, literature and music. 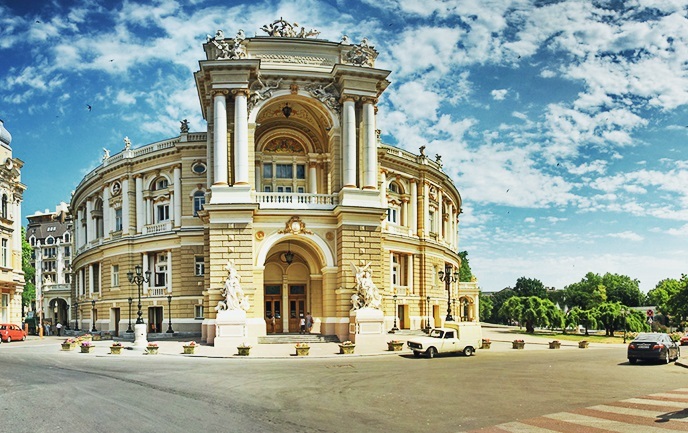 Odessa, often called “The Pearl of the Black Sea”, is one of the Ukrainian top cities in culture, science, education, literature, music and many other spheres of life. The city has a vibrancy all of its own due to its cosmopolitan history. Indeed, a close look at those who played a part in its emergence brings one to the conclusion that Odessa has always been a strikingly international place. Its first builders, the brothers Joseph and Felix de Ribas were of Spanish extraction. Franz de Volant, the first city planner, was a Dutchman. Duke Emmanuel de Richelieu, the first province and city Governor, was French, and so was his friend and successor, Count Alexandre de Langeron. General Coble, the city commandant, was English, Governor General Mikhail Vorontsov was a Russian prince, Grigoriy Marazli, a Greek, headed the municipal government. Italians were predominant among the architects: F.Boffo, A.Bernardazzi, G.Toricelli and F.Morandi, to name a few. As for the populace, it was a mix from the very start: Ukrainians and Greeks, Russians and Jews, Moldavians and Poles, Bulgarians and Germans, as well as Italians, Frenchmen, Turks and Tatars. Sincere tolerance has always been the spirit among all the ethnic groups inhabiting Odessa. By the way, to be an Odessavite means to be a person of special nation, the peculiarities of which are humor and optimistic approach to life. In comparison with Moscow, which is more than 800 years old, and the mother of Russian cities- Kiev, which has celebrated its 1500th anniversary not long ago, or with many other Russian cities, Odessa is a young city. Its birthday is September 2, 1794. According to some views, there are two kinds of big city development: some cities grow slowly and gradually like the circles in the tree trunk, for instance, Paris, Moscow; others make a violent and pre-planned rush in their development, like St. Petersburg (“Northern Palmira”) and Odessa (“Southern Palmira”). The design of the old part of Odessa is a wonderful masterpiece of classical architecture. At once the young Odessa deserved the fame of a free, even foreign, port which was often referred to as “the golden port”. Many noblemen, officers and merchants came to spend their holidays here. After the World War II, the city was rebuilt and greatly expanded. There emerged a network of parks, sanatoriums, new residential areas along the sea-coast. Nowadays Odessa is the biggest city of Ukraine. Welcome to Odessa and we will do our best to show you our beloved city! We are the Ukrainian incoming and outgoing tour operator "Modes" which has been successfully working since 1992. For the years of effective work our company has been awarded with different medals . Incoming and organization of tours to Ukraine is one of the priorities of our activities. By offering top quality products at extremely competitive prices our company “Modes” has managed to build a reputation amongst our tourists and partners which is a guarantee for reliability and professional service, to which we add a very important extra ingredient: our passion for hospitality. We can arrange special tour programs for any number of days and guests and offer a wide range of inspiring tours in Odessa and throughout Ukraine providing the following services: hotel accommodation, airport transfers, coaching, sightseeing, guide services, meals, attractions. Every year Ukraine attracts more and more tourists from all over the world. Such cities as Kiev, the capital and the oldest city of Ukraine, Lviv, covered with atmosphere old times, mysterious and full of architectural places of interest, and Odessa is the capital of humor, with its most unforgettable atmosphere are extremely popular among tourists. This tour brings the tourists to the main highlights of the city that are familiar even to those who have never visited it: Opera House, Potemkin Steps, monument to Rishilieu, Deribasovskaya street... Come and touch the history and the present life of this magnetic city. 2. The Mysteries of the Odessa Catacombs. The city catacombs appeared as a result of the extraction of the limestone used for the construction of Odessa and they are everywhere under the city and its suburbs. A lot of myths and legends about this underground town have been rumored from the very beginning. The catacombs gave shelter to the homeless people, to those who were crashed and pursued, to the thieves and the smugglers. But mainly the catacombs are known for the partisan movement in Odessa during the WW2. On the place of one of such partisan detachments in the village of Nerubaiskoye a unique underground Museum of Partisan Glory was organized. Is located in the mouth of the Dniester river, 80 km from Odessa. The modern town of Bilghorod-Dnistrovsky begins its history in the 6th century BC, when the ancient Greek town of Tyra was founded on the right bank of the river. 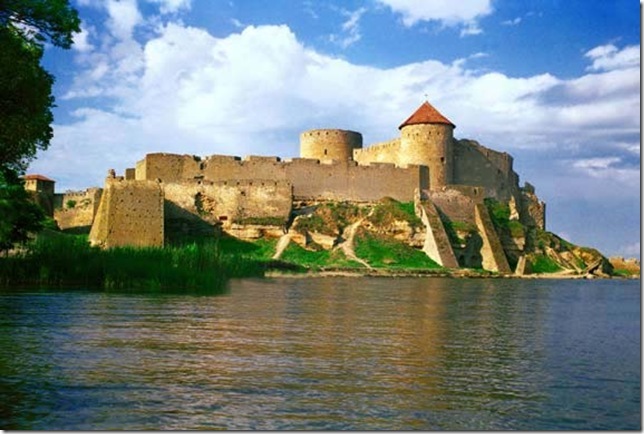 Within the long period of its existence the fortress has survived dozens of wars and rulers, each bringing new architectural and military elements to the original towers and walls. After visiting the fortress you can gladden your heart with the best wines in a factory located in the village of Shabo- the first and the only one Swiss colony in the former Russian Empire, which began to exist since 17th century. 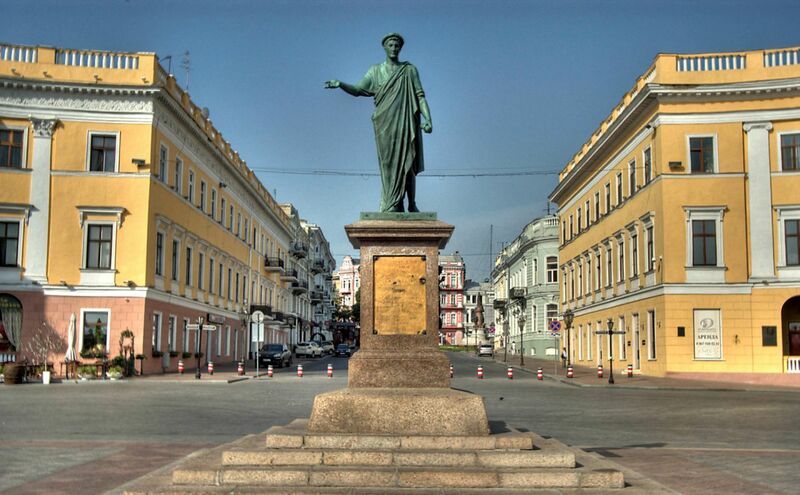 This tour will bring you to the famous Museum of Literature and to the places connected with the names of famous writers and poets that lived in Odessa and glorified it. 5. Different cultures of Odessa. Odessa always was known as a multinational city, and the presence of different peoples was reflected in the variety of temples of different religious denominations: Ukrainian Orthodox and Roman Catholic, Lutheran and Moslem, Protestant and Greek Orthodox, Karaite and Judaic. A tour to one of the monasteries or corvents can be organized. Excursion is dedicated to the life of a famous jazzman Leonid Utesov and other musicians who lived and worked in Odessa. Such tour could appear in any other city of Ukraine and Russia, but only in Odessa local thieves, burglars, gangsters and swindlers were known for their special "chic" and "high-class skill". Their names were whispered both with horror and and secret admiration, many of them became the characters of books describing the life of the city in the 19th-beginning of the 20th cent. 8. Vilkovo- "The Town On Water". This small town is located 189 km away from Odessa, in the mouth of the Danube and often is referred to as "Ukrainian Venice". There for sure you will enjoy fish meal after boating along its canal-streets. Contraband - almost a legitimate way to earn a living in Odessa. It's no secret that the smuggling world does not sleep, only instead of \French perfume and tights our "craftsmen" are looking illegal ways import for cars, alcohol, weapons, antiques and art objects. By the way, Alexander (the owner of the museum) has a story of the emerald necklace of Catherine the Great, who in 1980 tried to take over the port director of the Moscow store. In this amazing museum will tell you how these talents were exposed.